one of the world's great table cheeses with a smooth, ripe, slightly spicy flavor ...read more. 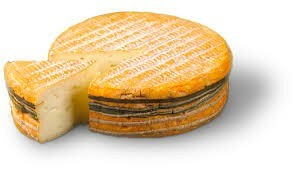 (8.8oz 250g) - Named after a village in Normandy, it is likely one of the most ancient cheeses from the region. 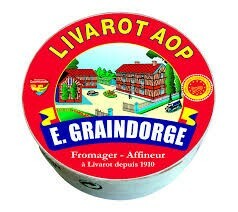 Livarot is a very strong smelling cheese, but like some other washed-rind cheeses, its bark is far worse than its bite When young, the semi-soft paste has a springy quality, but as it matures and comes to room temperature, the texture oozes and becomes nearly liquid; the intensity of flavor also increases at this point, becoming beefy and yeasty. The wheel's outer edge is encircled with strips of raffia or paper that prevent the cheese from collapsing during maturing -- the strips are reminiscent of a colonel's stripes, giving the cheese its nickname "The Colonel". Made of pasteurized cows' milk.